Ernesto Guevara de la Serna (June 14, 1928 - October 9, 1967), commonly known as Che Guevara or el Che, was an Argentine-born physician, Marxist, politician, and leader of Cuban and internationalist guerrillas. As a young man, Guevara traveled "rough" throughout Latin America to study and spread medicine, throughout his travels he came into direct contact with the many people in poverty. Through these experiences he became convinced that only revolution could remedy the region's economic inequality, this lead Guevara to Marxism and soon became involved in Guatemala's social revolution under President Jacobo Arbenz Guzmán. Some time later, Guevara became a member of Fidel Castro's paramilitary 26th of July Movement, which seized power in Cuba in 1959. 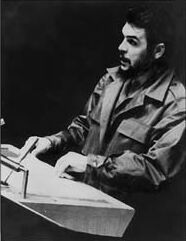 After serving in various important posts in the new government and writing a number of articles and books on the theory and practice of guerrilla warfare, Guevara left Cuba in 1965 with the intention of fomenting revolutions first in the Congo-Kinshasa (later named the Democratic Republic of the Congo) and then in Bolivia, where he was captured in a Central Intelligence Agency (CIA)/ U.S. Army Special Forces-organized military operation. Guevara died at the hands of the Bolivian Army in La Higuera near Vallegrande on October 9, 1967. Participants in, and witnesses to, the events of his final hours testify that his captors executed him without trial. After his death, Guevara became an icon of socialist revolutionary movements worldwide. 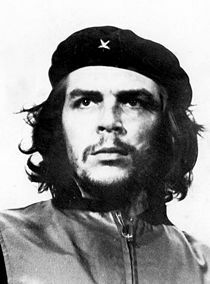 An Alberto Korda photo of Guevara (shown) has received wide distribution and modification. Ernesto Guevara de la Serna was born in Rosario, Argentina, but the exact date of his birth is unknown. He was the eldest of five children in a family of mixed Spanish and Irish descent; both his father and mother were of Basque ancestry. Guevara's family were an upper-class family with some leftist views. He became known for his dynamic personality and radical perspective even as a boy. Although Guevara suffered from the crippling bouts of asthma that afflicted him throughout his life, he excelled as an athlete. He was an avid rugby union player despite his handicap and earned himself the nickname "Fuser"—a contraction of "El Furibundo" (English: raging) and his mother's surname, "Serna"—for his aggressive style of play. He became passionate about chess, and began entering tournaments from the age of 12. As an adolescent, he became inspired by poetry, especially that of Pablo Neruda and wrote poetry for the rest of his life. He was also an enthusiastic and eclectic reader, with interests ranging from adventure classics by Jack London and Jules Verne to essays on sexuality by Sigmund Freud and treatises on social philosophy by Bertrand Russell. In his late teens, he developed a keen interest in photography and spent many hours photographing people, places and, during later travels, archaeological sites. In 1948 Guevara entered the University of Buenos Aires to study medicine. After a few interruptions, he completed his formal medical studies there in March of 1953 and received his diploma in June of that year. However, it is not clear whether he ever fulfilled the clinical training required to practice medicine. While a student, Guevara spent long periods traveling around Latin America. In 1951 his older friend, Alberto Granado, a biochemist, suggested that Guevara take a year off from his medical studies to embark on a trip they had talked of making for years, traversing South America. Guevara and 29-year-old Granado soon set off from their hometown of Alta Gracia and embarked on their journey on a 1939 Norton 500 cc motorcycle that they named La Poderosa II (English: "the Mighty One, the Second"). The had many plans, especially to spend a few weeks volunteering at the San Pablo Leper colony in Peru on the banks of the Amazon River. Guevara narrated this journey in The Motorcycle Diaries, which was translated into English in 1996 and used in 2004 as the basis for a motion picture of the same name. Through his first-hand observations of poverty, oppression, and powerlessness of the masses, Guevara soon became highly influenced by his informal Marxist studies. He concluded that the only solution for Latin America's economic and social inequities lay in revolution. His travels also inspired him to look upon Latin America not as a collection of separate nations but as a single entity, the liberation of which would require a continent-wide strategy; he began to imagine the possibility of a united Ibero-America without borders, bound together by a common 'mestizo' culture, an idea that would figure prominently in his later revolutionary activities. Upon his return to Argentina, he completed his medical studies quickly in order to continue his travels around South and Central America. Socialist revolutionary Che Guevara was born in Argentina and received the nickname "Che" because of his frequent use of the Argentine word Che, meaning "pal" or "mate"
According to Jon Anderson, the Peruvian socialist Hilda Gadea was Guevara's main political contact in Guatemala. Gadea introduced him to high-level politicians in the Arbenz government. Gadea was a member of the American Popular Revolutionary Alliance (APRA), a political movement led by Víctor Raúl Haya de la Torre, he also renewed contact with a group of Cuban exiles linked to Fidel Castro whom he had initially met in Costa Rica. Among the exiles was Antonio "Ñico" López, who was associated with the attack on the "Carlos Manuel de Céspedes" barracks in Bayamo in the Cuban province of Oriente  and who died at the Ojo del Toro bridge soon after the Granma landed in Cuba. Around this time Guevara acquired his famous nickname, "Che," due to his frequent use of the Argentine word Che, which roughly translates as 'pal' or 'mate'. For some time, Guevara's financial and economic situation was precarious and he stole some of Gadea's jewelry in desperation. Then, on May 15, 1954, a shipment of high-quality Skoda infantry and light artillery weapons was sent from Communist Czechoslovakia for the Arbenz Government and arrived in Puerto Barrios aboard the Swedish ship Alfhem. The CIA estimated that the amount of weapons was two thousand tons and 2 tons was the estimation given by Jon Lee Anderson, probably a typographical error. Guevara briefly left Guatemala for El Salvador to pick up a new visa, then returned to Guatemala. Meanwhile, the CIA-sponsored coup attempt led by Carlos Castillo Armas had begun. The anti-Arbenz forces were unable to stop the trans-shipment of the Czech weapons by train, however, after recovering energy, and apparently with the help of air support, they started to gain ground. Guevara joined an armed militia organized by the Communist Youth for several days, but soon returned to medical duties. 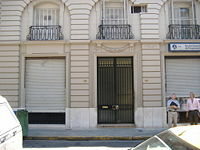 Following the coup Guevara volunteered to fight, but Arbenz told his foreign supporters to leave the country, and after Gadea was arrested, he briefly took refuge in the Argentine consulate and then moved on to Mexico. The overthrow of the Arbenz government by a coup d'état backed by the Central Intelligence Agency cemented Guevara's view of the United States as an imperialist power that would consistently oppose governments attempting to address the socioeconomic inequality endemic to Latin America and other developing countries. This strengthened his conviction that socialism achieved through armed struggle and defended by an armed populace was the only way to rectify such problems. After the battle of Santa Clara. The tank is a Sherman with a 76 mm cannon. Shortly after arriving in Mexico in early September 1954, Guevara renewed his friendship with Ñico López and the other Cuban exiles whom he had known in Guatemala. In June, López introduced him to Raúl Castro, Fidel's brother. Some weeks later, Fidel Castro arrived in Mexico City after his release from political prison in Cuba, and on the evening of July 8, 1955, Raúl introduced Guevara to him. During a fervid overnight conversation, Guevara became convinced that Castro was the inspirational revolutionary leader for whom he had been searching and he immediately joined the "26th of July Movement" that intended to overthrow Cuban dictator Fulgencio Batista. Although it was planned that he would be the group's medic, Guevara participated in the military training along with the other members of the Movement. At the end of the training course, Guevara was singled out by their instructor, Col. Alberto Bayo, as his most outstanding student. Meanwhile, Gadea had arrived from Guatemala and she and Guevara resumed their relationship. In the summer of 1955 she informed him that she was pregnant, Guevara's response was a marriage proposal. The wedding took place on August 18, 1955, and their daughter, whom they named Hilda Beatríz, was born on February 15, 1956. When the cabin cruiser Granma set out from Tuxpan, Veracruz for Cuba on November 25, 1956, Guevara was the only non-Cuban aboard. Attacked by Batista's military soon after landing, about half of the expeditionaries were killed or executed upon capture. This left only 15-20 battered rebels as a fighting force; they re-grouped and fled into the mountains of the Sierra Maestra to wage guerrilla warfare against the Batista regime. Guevara became a leader among the rebels, a Comandante (English translation: Major), and was respected by his comrades in arms for his courage, and feared for what some have described as "ruthlessness." Guevara's responsibility was the execution of many men that were found guilty of being informers, deserters, or spies. In the final days of December 1958, he directed the attack led by his "suicide squad" (which undertook the most dangerous tasks in the rebel army) on Santa Clara which was one of the decisive events of the revolution, although the bloody series of ambushes first during la ofensiva in the heights of the Sierra Maestra, and then at Guisa, and the whole Cauto Plains campaign that followed probably had more military significance. After learning that his generals, especially General Cantillo who had visited Castro at the inactive sugar mill "Central America," were making a separate peace with Castro, Batista fled to the Dominican Republic on January 1, 1959. On February 7, 1959, the victorious government proclaimed Guevara "a Cuban citizen by birth." Shortly thereafter, he initiated divorce proceedings to put a formal end to his marriage with Gadea, from whom he had been separated since before leaving Mexico on the Granma, and on June 2, 1959, he married Aleida March, a Cuban-born member of the 26th of July movement. He was appointed commander of the La Cabaña Fortress prison and during his six-month tenure in that post (January 2 through June 12, 1959), he oversaw the trial and execution of many people including former Batista regime officials, members of the BRAC (Buró de Represión de Actividades Comunistas, "Bureau for the Repression of Communist Activities") secret police, alleged war criminals, and political dissidents. The trials he conducted were alleged to be "unfair," according to Time Magazine. Later, Guevara became an official at the National Institute of Agrarian Reform, and President of the National Bank of Cuba (somewhat ironically, as he often condemned money, favored its abolition, and showed his disdain by signing Cuban banknotes with his nickname, "Che"). During this time his fondness for chess was rekindled, and he attended and participated in most national and international tournaments held in Cuba. He was particularly eager to encourage young Cubans to take up the game and organized various activities designed to stimulate their interest in it. Even as early as 1959, Guevara helped organize revolutionary expeditions overseas, all of which failed. The first attempt was made in Panama; another in the Dominican Republic (led by Henry Fuerte, also known as "El Argelino," and Enrique Jiménez Moya) took place on June 14 of that same year. In 1960 Guevara provided first aid to victims during the La Coubre arms shipment rescue operation that went further awry when a second explosion occurred, resulting in well over a hundred dead. It was at the memorial service for the victims of this explosion that Alberto Korda took the most famous photograph of him. Whether La Coubre was sabotaged or merely exploded by accident is not clear. Those who favour the sabotage theory sometimes attribute this to the Central Intelligence Agency and sometimes name William Alexander Morgan,  a former rival of Guevara's in the anti-Batista forces of the central provinces and later a putative CIA agent, as the perpetrator. Cuban exiles have put forth the theory that it was done by Guevara's USSR-loyalist rivals. Guevara later served as Minister of Industries, in which post he helped formulate Cuban socialism, and became one of the country's most prominent figures. In his book Guerrilla Warfare, he advocated replicating the Cuban model of revolution initiated by a small group (foco) of guerrillas without the need for broad organizations to precede armed insurrection. His essay El socialismo y el hombre en Cuba (1965) (Man and Socialism in Cuba) advocates the need to shape a "new man" (hombre nuevo) in conjunction with a socialist state. Some saw Guevara as the simultaneously glamorous and austere model of that "new man." During the 1961 Bay of Pigs Invasion, Guevara did not participate in the fighting, having been ordered by Castro to a command post in Cuba's westernmost Pinar del Río province where he was involved in fending off a decoy force. He did, however, suffer a bullet wound to the face during this deployment, which he said had been caused by the accidental firing of his own gun. Guevara played a key role in bringing to Cuba the Soviet nuclear-armed ballistic missiles that precipitated the Cuban Missile Crisis in October 1962. During an interview with the British newspaper Daily Worker some months later, he stated that, if the missiles had been under Cuban control, they would have fired them against major U.S. cities. In December 1964, Che Guevara traveled to New York City as the head of the Cuban delegation to speak at the UN. He also appeared on the CBS Sunday news program Face the Nation and met with a gamut of people and groups including U.S. Senator Eugene McCarthy, several associates of Malcolm X, and Canadian radical Michelle Duclos. On December 17, Guevara flew to Paris and embarked on a three-month international tour during which he visited the People's Republic of China, the United Arab Republic (Egypt), Algeria, Ghana, Guinea, Mali, Dahomey, Congo-Brazzaville and Tanzania, with stops in Ireland, Paris and Prague. In Algiers on February 24, 1965, he made what turned out to be his last public appearance on the international stage when he delivered a speech to the "Second Economic Seminar on Afro-Asian Solidarity" in which he declared, "There are no frontiers in this struggle to the death. We cannot remain indifferent in the face of what occurs in any part of the world. A victory for any country against imperialism is our victory, just as any country's defeat is our defeat." He then astonished his audience by proclaiming, "The socialist countries have the moral duty of liquidating their tacit complicity with the exploiting countries of the West." He proceeded to outline a number of measures which he said the communist-bloc countries should implement in order to accomplish this objective. He returned to Cuba on March 14 to a solemn reception by Fidel and Raúl Castro, Osvaldo Dorticós, and Carlos Rafael Rodríguez at the Havana airport. Two weeks later, Guevara dropped out of public life and then vanished altogether. His whereabouts were the great mystery of 1965 in Cuba, as he was generally regarded as second in power to Castro himself. His disappearance was variously attributed to the relative failure of the industrialization scheme he had advocated while minister of industry, the pressure exerted on Castro by Soviet officials disapproving of Guevara's pro-Chinese Communist bent as the Sino-Soviet split grew more pronounced, and to serious differences between Guevara and the Cuban leadership regarding Cuba's economic development and ideological line. 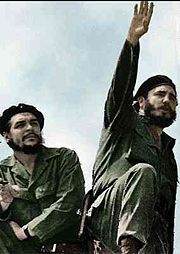 It may also be that Castro had grown increasingly wary of Guevara's popularity and considered him a potential threat. Castro's critics sometimes say his explanations for Guevara's disappearance have always been suspect, and many found it surprising that Guevara never announced his intentions publicly, but only through an undated and uncharacteristically obsequious letter to Castro. Guevara's support for Chinese Communism was increasingly problematic for Cuba as the nation's economy became more and more dependent on the Soviet Union. Since the early days of the Cuban revolution, Guevara had been considered an advocate of Maoist strategy in Latin America and the originator of a plan for the rapid industrialization of Cuba, which some compared to China's "Great Leap Forward." According to Western "observers" of the Cuban situation, the fact that Guevara was opposed to Soviet conditions and recommendations that Castro seemed obliged to accept might have been the reason for his disappearance. However, both Guevara and Castro were supportive of the idea of a united front, including the Soviet Union and China, and had made several unsuccessful attempts to reconcile the feuding parties. Following the Cuban Missile Crisis and what he perceived as a Soviet betrayal of Cuba when Nikita Khrushchev agreed to withdraw the missiles from Cuban territory without consulting Castro, Guevara had grown more skeptical of the Soviet Union. As revealed in his last speech in Algiers, he had come to view the Northern Hemisphere, led by the U.S. in the West and the Soviet Union in the East, as the exploiter of the Southern Hemisphere. He strongly supported Communist North Vietnam in the Vietnam War, and urged the peoples of other developing countries to take up arms and create "many Vietnams". Pressed by international speculation regarding Guevara's fate, Castro stated on June 16, 1965, that the people would be informed about Guevara when Guevara himself wished to let them know. Numerous rumors about his disappearance spread both inside and outside Cuba. On October 3 of that year, Castro revealed an undated letter purportedly written to him by Guevara some months earlier in which Guevara reaffirmed his enduring solidarity with the Cuban Revolution but declared his intention to leave Cuba to fight abroad for the cause of the revolution. He explained that "Other nations of the world summon my modest efforts," and that he had therefore decided to go and fight as a guerrilla "on new battlefields." In the letter, Guevara announced his resignation from all his positions in the government, in the party, and in the Army, and renounced his Cuban citizenship, which had been granted to him in 1959 in recognition of his efforts on behalf of the revolution. During an interview with four foreign correspondents on November 1, Castro remarked that he knew where Guevara was but would not disclose his location, and added, denying reports that his former comrade-in-arms was dead, that "he is in the best of health." Despite Castro's assurances, Guevara's fate remained a mystery at the end of 1965 and his movements and whereabouts continued to be a closely held secret for the next two years. Listening to a shortwave radio are (seated from the left) Rogelio Oliva, José María Martínez Tamayo (known as "Mbili" in the Congo and "Ricardo" in Bolivia), and Guevara. Standing behind them is Roberto Sánchez ("Lawton" in Cuba and "Changa" in the Congo). During their all-night meeting on March 14–March 15, 1965, Guevara and Castro had agreed that the former would personally lead Cuba's first military action in Africa. The Cuban operation was to be carried out in support of the pro-Marxist Simba movement in the Congo-Kinshasa (formerly Belgian Congo). Guevara, his second-in-command Victor Dreke, and twelve of the Cuban expeditionaries arrived in the Congo on April 24, 1965; the other Cubans joined them soon afterwards. They collaborated for a time with guerrilla leader Laurent-Désiré Kabila, who helped Lumumba supporters lead a revolt that was suppressed in November of that same year by the Congolese army. Guevara dismissed Kabila as insignificant. "Nothing leads me to believe he is the man of the hour," Guevara wrote. Although Guevara was 37 at the time and had no formal military training, he had the experiences of the Cuban revolution, including his successful march on Santa Clara, which was central to Batista finally being overthrown by Castro's forces. His asthma had prevented him from being drafted into military service in Argentina, a fact of which he was proud given his opposition to the Perón government. South African mercenaries including Mike Hoare and Cuban exiles worked with the Congolese army to thwart Guevara. They were able to monitor Guevara's communications, arrange to ambush the rebels and the Cubans whenever they attempted to attack, and interdict Guevara's supply lines. Guevara's aim was to export the Cuban Revolution by instructing local Simba fighters in communist ideology and strategies of guerrilla warfare. The incompetence, intransigence, and infighting of the local Congolese forces are cited by Guevara in his Congo Diaries as the key reasons for the revolt's failure. Later that same year, ill, suffering from his asthma, and frustrated after seven months of hardship, Guevara left the Congo with the Cuban survivors (six members of his column had died). At one point Guevara had considered sending the wounded back to Cuba, then standing alone and fighting until the end in the Congo as a revolutionary example; after being persuaded by his comrades in arms and two emissaries sent by Castro, however, he finally agreed to leave the Congo. Because Castro had made public Guevara's letter "Farewell Letter," a letter Guevara had intended should only be revealed in case of his death—wherein he had written that he was severing all ties to Cuba in order to devote himself to revolutionary activities in other parts of the world, he felt that he could not return to Cuba with the other surviving combatants for moral reasons, and he spent the next six months living clandestinely in Dar-es-Salaam, Prague and East Germany (GDR). During this time he compiled his memoirs of the Congo experience, and also wrote drafts of two more books, one on philosophy and the other on economics. Throughout this period Castro said he continued to importune him to return to Cuba, but Guevara only agreed to do so when it was understood that he would be there on a strictly temporary basis for the few months needed to prepare a new revolutionary effort somewhere in Latin America, and that his presence on the island would be cloaked in the tightest secrecy. Speculation on Guevara's whereabouts continued throughout 1966 and into 1967. Representatives of the Mozambican independence movement FRELIMO reported meeting with Guevara in late 1966 or early 1967 in Dar es Salaam, at which point they rejected his offer of aid in their revolutionary project. In a speech at the 1967 May Day rally in Havana, the Acting Minister of the armed forces, Maj. Juan Almeida, announced that Guevara was "serving the revolution somewhere in Latin America." The persistent reports that he was leading the guerrillas in Bolivia were eventually shown to be true. At Castro's request, a parcel of land in a remote area had been purchased by native Bolivian Communists for Guevara to use as a training area and base camp. The evidence suggests that the training at this camp in the Ñancahuazú region was more hazardous than combat to Guevara and the Cubans accompanying him. Little was accomplished in the way of building a guerrilla army. Former East German secret police operative Haydée Tamara Bunke Bider, better known by her nom de guerre "Tania," who had been installed as his primary agent in La Paz, was reportedly also working for the Soviet KGB and is widely inferred to have unwittingly served Soviet interests by leading Bolivian authorities to Guevara's trail. The numerous photographs taken by and of Guevara and other members of his guerrilla group, which were left behind at their base camp after the initial clash with the Bolivian army in March 1967, provided President René Barrientos with the first proof of his presence in Bolivia; after viewing them, Barrientos allegedly said he wanted Guevara's head displayed on a pike in downtown La Paz. He thereupon ordered the Bolivian Army to hunt Guevara and his followers down. Guevara's guerrilla force, numbering about 50 and operating as the ELN (Ejército de Liberación Nacional de Bolivia; English: "National Liberation Army of Bolivia"), was well equipped and scored a number of early successes against Bolivian regulars in the difficult terrain of the mountainous Camiri region. In September, however, the Army managed to eliminate two guerrilla groups, reportedly killing one of the leaders. Guevara's plan for fomenting revolution in Bolivia appears to have been based upon a number of misconceptions. For example, he thought that help would be forthcoming from local dissidents, but never did, and while the poorly trained and equipped Bolivian army against whom he was fighting received aid he had not expected from the CIA. His penchant for confrontation rather than compromise appears to have contributed to his inability to develop successful working relationships with local leaders in Bolivia, just as it had in the Congo. This tendency had surfaced during his guerrilla warfare campaign in Cuba as well, but had been kept in check there by the timely interventions and guidance of Castro. The schoolhouse in La Higuera where Che Guevara was executed at 1:10 p.m. on October 9, 1967. The Bolivian Special Forces were notified of the location of Guevara's guerrilla encampment by an informant. On October 8, the encampment was encircled, and Guevara was captured while leading a patrol in the vicinity of La Higuera. He offered to surrender after being wounded in the legs and having his rifle destroyed by a bullet. According to some soldiers present at the capture, during the skirmish as they approached Guevara, he allegedly shouted, "Do not shoot! I am Che Guevara and worth more to you alive than dead." Barrientos promptly ordered his execution upon being informed of his capture. 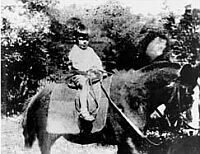 Guevara was taken to a dilapidated schoolhouse where he was held overnight. Early the next afternoon he was executed. The executioner was Mario Terán, a sergeant in the Bolivian army who had drawn a short straw and was designated to shoot Guevara. Guevara received multiple shots to the legs, so as to avoid maiming his face for identification purposes and simulate combat wounds in an attempt to conceal his execution. Che Guevara did have some last words before his death; he allegedly said to his executioner, "I know you are here to kill me. Shoot, coward, you are only going to kill a man." His body was lashed to the landing skids of a helicopter and flown to neighboring Vallegrande where it was laid out on a laundry tub in the local hospital and displayed to the press. Photographs taken at that time gave rise to legends such as those of San Ernesto de La Higuera and El Cristo de Vallegrande. After a military doctor surgically amputated his hands, Bolivian army officers transferred Guevara's cadaver to an undisclosed location and refused to reveal whether his remains had been buried or cremated. 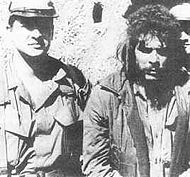 The hunt for Guevara in Bolivia was headed by Félix Rodríguez, a CIA agent, who previously had been infiltrated into Cuba to prepare contacts with the rebels in the Escambray Mountains and the anti-Castro underground in Havana prior to the Bay of Pigs invasion, and had been successfully extracted from Cuba after it. 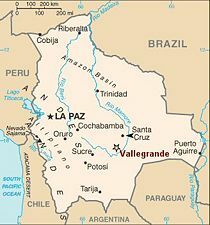 Upon hearing of Guevara's capture, Rodríguez relayed the information to CIA headquarters at Langley, Virginia, via CIA stations in various South American nations. After the execution, Rodríguez took Guevara's Rolex watch and several other personal items, often proudly showing them to reporters during the ensuing years. Today, some of these belongings, including his flashlight, are on display at the CIA. A side issue connected with the guerrillas was the arrest and trial of Régis Debray. In April 1967 government forces captured Debray, a young French professor of philosophy at the University of Havana who had studied in the Ecole Normale Supérieure with Marxist philosopher Louis Althusser, and accused him of collaborating with the guerrillas. Debray claimed that he had merely been acting as a reporter, and revealed that Guevara, who had mysteriously disappeared two years earlier, was leading the guerrillas. As Debray's trial—which had become an international cause célèbre—was beginning in early October, Bolivian authorities on October 11 reported (falsely) that Guevara had been shot and killed in an engagement with government forces two days earlier. On October 15 Castro acknowledged that Guevara was dead and proclaimed three days of public mourning throughout Cuba. The death of Guevara was regarded as a severe blow to the socialist revolutionary movements throughout Latin America and the rest of the third world countries. In 1997 the skeletal remains of Guevara's handless body were exhumed from beneath an air strip near Vallegrande, positively identified by DNA matching, and returned to Cuba. 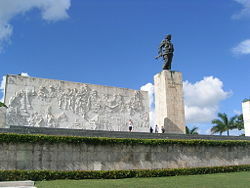 On October 17, 1997, his remains, along with those of six of his fellow combatants killed during the guerrilla campaign in Bolivia, were laid to rest with full military honors in a specially built mausoleum in the city of Santa Clara, where he had won the said decisive battle of the Cuban Revolution 39 years before. Though he has been labeled by some as a "hero," opponents of Guevara, including most of the Cuban exile community (and refugees from other countries under communism), think of him as a killer and terrorist. They point to the less savory aspects of Guevara's life, taking the viewpoint that he was enthusiastic about executing opponents of the Cuban Revolution. Guevara in fact founded Cuba's labor camp system, establishing its first labor camp in Guanahacabibes to jail opponents of the revolution who were not guilty of any crime Cuba's labor camp system was eventually used to jail "gays, dissidents, and AIDS victims." Some of Guevara's writing is cited as evidence of his attitude toward executing dissidents, as quoted in an article by Álvaro Vargas Llosa called "The Killing Machine: Che Guevara, from Communist Firebrand to Capitalist Brand." For example, in his "Message to the Tricontinental," he writes of "hatred as an element of struggle; unbending hatred for the enemy, which pushes a human being beyond his natural limitations, making him into an effective, violent, selective, and cold-blooded killing machine." Detractors argue that while much propaganda depicts him as a formidable warrior, Guevara was ineffective; in reality a poor tactician. 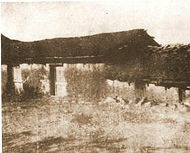 They dispute accounts of the Battle of Santa Clara; on the capturing of a train supplying heavy reinforcements, critic Álvaro Vargas Llosa writes, "Numerous testimonies indicate that the commander of the train surrendered in advance, perhaps after taking bribes." Some critics claim that Guevara was a major failure at managing the Cuban economy, as he "oversaw the near-collapse of sugar production, the failure of industrialization, and the introduction of rationing—all this in what had been one of Latin America’s four most economically successful countries since before the Batista dictatorship." There is also the belief by some critics that, because there is no documentary evidence of Guevara having earned a medical degree, he was not actually a doctor. Nonetheless, he remains for many an iconic figure, an intellectual militant whose passion was to eradicate poverty. He may have been over-zealous, as were the perpetuators of the French Revolution but his intent was to improve the life conditions of the many, not of the few. Guevara was called "the most complete human being of our age" by the French philosopher Jean-Paul Sartre. Guevara's supporters believe he may yet prove to be the most important thinker and activist in Latin America since Simón Bolívar, leader of the South American independence movement and hero to subsequent generations of nationalists throughout Latin America. The photo of Guevara by Alberto Korda has received wide distribution and modification. The Maryland Institute College of Art called this picture "the most famous photograph in the world and a symbol of the 20th century." Che Guevara has continued as a cultural icon, as displayed on popular Che Guevara T-shirts. ↑ Jon Lee Anderson, Che Guevara: A Revolutionary Life (New York, NY: Grove Press, 1997, ISBN 0802116000). ↑ Ernesto Guevara Lynch, "En Guatemala me perfeccionaré y lograré lo que me falta para ser un revolulcionario auténtico" Aquí va un soldado de América (Barcelona: Plaza y Janés Editores, S.A., 2000), 26. ↑ Radio Cadena Agramonte, "Ataque al cuartel del Bayamo". Retrieved February 25, 2006. ↑ U.S. Department of State,"Foreign Relations, Guatemala, 1952-1954." Retrieved March 4, 2006. ↑ U.S. Department of State. "Foreign Relations, Guatemala, 1952-1954." Retrieved March 4, 2006. ↑ Max Holland, "Private Sources of U.S. Foreign Policy: William Pawley and the 1954 Coup d'Etat in Guatemala," Journal of Cold War Studies 7(4) (2005):36-73. ↑ Ernesto Che Guevara, "Suicide Squad: Example Of Revolutionary Morale (an excerpt from Episodes of the Cuban Revolutionary War - 1956-1958). The Militant. Retrieved March 27 2006. ↑ Anderson, 1997, 372 and 425. ↑ TIME magazine, "The TIME 100: Heroes and Icons." Retrieved June 26, 2006. ↑ chessgames.com, "Miguel Najdorf vs Ernesto Che Guevara." chessgames.com. Retrieved January 5, 2006. ↑ Puerto Padre website, "Cronologia" (List of anniversaries) Puerto Padre website. Retrieved January 4, 2006. ↑ Emilio Herasme Peña," La Expedición Armada de junio de 1959," June 14, 2004. Listín Diario (Dominican Republic). Retrieved January 4, 2006. ↑ Cuban Information Archives, "La Coubre explodes in Havana 1960.". Retrieved February 26, 2006; pictures can be seen at Cuban site fotospl.com. ↑ Defensa Nacional, "SABOTAJE AL BUQUE LA COUBRE". Retrieved February 26, 2006. ↑ Guaracabuya.org, "Recuento Histórico:El porque el PCC ordenó volar el barco "La Coubre." Retrieved February 26, 2006. ↑ Anderson 1997, 545: "In an interview with Che a few weeks after the crisis, Sam Russell, a British correspondent for the socialist Daily Worker, found Guevara still fuming over the Soviet betrayal. Alternately puffing on a cigar and taking blasts from an inhaler, Guevara told Russell that if the missiles had been under Cuban control, they would have fired them off. Russell came away with mixed feelings about Che, calling him 'a warm character whom I took to immediately...clearly a man of great intelligence though I thought he was crackers from the way he went on about the missiles.'" ↑ Montreal Gazette, "Liberals picked the wrong issue." Retrieved February 26, 2006. ↑ Guaracabuya.org, "TERRORISTS CONNECTED TO CUBAN COMMUNIST GOVERNMENT." Retrieved February 26, 2006. ↑ Ernesto Che Guevara, (editors Rolando E. Bonachea and Nelson P. Valdés), Che: Selected Works of Ernesto Guevara (Cambridge, MA: 1969), 350. ↑ 23.0 23.1 Ernesto Che Guevara, "English Translation of Complete Text of Algiers Speech." Sozialistische Klassiker. Retrieved January 4, 2006. ↑ Ernesto Che Guevara, (editors Rolando E. Bonachea and Nelson P. Valdés), Che: Selected Works of Ernesto Guevara (Cambridge, MA: 1969), 352-359. ↑ Ernesto Che Guevara, "English Translation of Complete Text of his Message to the Tricontinental". ↑ William Gálvez, Che in Africa: Che Guevara's Congo Diary (Melbourne: Ocean Press, 1999), 62. ↑ BBC News,"Profile: Laurent Kabila," BBC News, May 26, 2001. Retrieved January 5, 2006. ↑ African History Blog, "Che Guevara's Exploits in the Congo," African History. Retrieved January 5, 2006. ↑ Ireland's Own, "From Cuba to Congo, Dream to Disaster for Che Guevara." Irelandsown.net. Retrieved January 11, 2006. ↑ Ernesto Che Guevara, Apuntes Filosóficos, draft. ↑ Ernesto Che Guevara, Notas Económicas, draft. ↑ James H. Mittleman, Underdevelopment and the Transition to Socialism - Mozambique and Tanzania (New York, NY: Academic Press, 1981), 38. ↑ Major Donald R. Selvage - USMC, "Che Guevara in Bolivia," GlobalSecurity.org, April 1, 1985. Retrieved January 5, 2006. ↑ Paco Ignacio Taibo, II, Ernesto Guevara, también conocido como el Che (Barcelona, Editorial Planeta, 1999), 726. ↑ Ernesto Che Guevara, "Excerpt from Pasajes de la guerra revolucionaria: Congo," Cold War International History Project. Retrieved April 26, 2006. ↑ Jorge G. Castañeda, Che Guevara: Compañero (New York, NY: Random House, 19980, 107-112, 131-132. ↑ Richard Gott, "Bolivia on the Day of the Death of Che Guevara." Mindfully.org. Retrieved February 26, 2006. ↑ El Nuevo Cojo Ilustrado, "Galeria Che Guevara." Retrieved April 27, 2006. ↑ Felix I. Rodriguez and John Weisman, Shadow Warrior/the CIA Hero of a Hundred Unknown Battles (Hardcover) (New York, NY: Simon & Schuster, 1989). ↑ NewsMax, "Félix Rodríguez: Kerry No Foe of Castro." Retrieved February 27, 2006. ↑ marxists.org "Louis Althusser." Retrieved March 11, 2006. ↑ Samuel Farber, "The Resurrection of Che Guevara," William Paterson University, 1998. Retrieved June 18, 2006. ↑ Paul Berman, "The Cult of Che," Slate, September, 24 2004. Retrieved June 18, 2006. ↑ 44.0 44.1 Álvaro Vargas Llosa, "The Killing Machine: Che Guevara, from Communist Firebrand to Capitalist Brand," New Republic, July 11, 2005. Retrieved January 5, 2006. ↑ Humberto Fontova, "Fidel's executioner." FrontPage magazine. Retrieved February 26, 2006. ↑ History News Network, "Che Guevara... The Dark Underside of the Romantic Hero." Retrieved February 26, 2006. ↑ Free Cuba Foundation, "Che Guevara's Dubious Legacy." Retrieved February 26, 2006. ↑ Humberto Fontova, "Fidel's Executioner". FrontPage magazine. Retrieved February 25, 2006. ↑ Michael Moynihan, "Neutering Sartre at Dagens Nyheter." Stockholm Spectator. Retrieved February 26, 2006. ↑ Maryland Institute of Art, referenced at BBC News, "Che Guevara photographer dies," BBC News, May 26, 2001. Retrieved January 4, 2006. Bravo, Marcos. La Otra Cara Del Che, Editorial Solar. Bogota, Colombia, 2000. “I’d like to confess, papá, at that moment I discovered that I really like killing.” Guevara writing to his father. Feldman, Allen Political Terror and the Technologies of Memory: Excuse, Sacrifice, Commodification, and Actuarial Moralities. Radical History Review (85) (2003): 58-73. Holland, Max. Private Sources of U.S. Foreign Policy: William Pawley and the 1954 Coup d'État in Guatemala, Journal of Cold War Studies 7(4) (2005): 36-73. All links retrieved February 8, 2017. This page was last modified on 8 February 2017, at 15:11.